Summer is a very busy time for the Amish people. The Amish women and children tend to their large gardens, keeping them free from weeds and picking ripe fruit and vegetables. 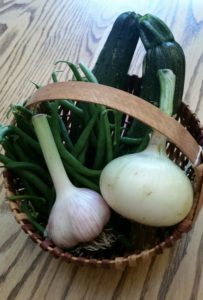 Many of the Amish farms we stop at tend to have small garden plots near their home with larger gardens elsewhere on the farm. After nine years of giving these tours, I’m still amazed at the size of their produce – imagine onions the size of softballs! A hard frost damaged some of the strawberry plants this spring, so strawberries have not been as plentiful for the Amish as they had wanted. It looks like many of the raspberries are ready and are quite abundant. Most Amish women are canning raspberry jams, jellies, and pie filling this time of year. One of my favorite berries they often sell are wild black caps (black raspberries). The Amish folks venture out into their woods to pick the sweet, wild black raspberries. Their arms often bear lots of scratches from the brambles, showing their hard work in finding the berries. One of my favorite desserts is vanilla ice cream topped with fresh, Amish-picked, black caps! While the Amish women and children are busy tending gardens and canning produce, the Amish men and boys (and sometimes the women) are busy cultivating corn, mowing, raking, and loading hay from their fields. All of this field work is done with a team of work horses. They do not use tractors in their field like their English (non-Amish) neighbors. It is tough work loading cut, loose hay onto the hay wagon only to then unload it into the upper level of the barn in the hay mow. Hot weather is needed to dry the hay before it can be brought out of the field and placed in the barn. While on the tour, I spied a couple of Amish men shocking oats in their field. The oats are cut with a binder pulled by a horse and bundles of oats are dropped on the ground. The Amish men and boys walk the field, stacking the oats into shocks to dry. Once again, much walking and hard work is done in the field. When the oats are dry, the Amish farmers will collect the oat shocks by tossing them onto a horse-drawn wagon and bringing them to the farm to harvest. The Amish farmers use a large engine-and-belt-driven threshing machine to separate the grain. Often they set the thresher in the barn and toss the oat bundles into the thresher. The threshed grain is unloaded into one bin while the straw is blown out in another bin to keep for livestock bedding. Don’t just take my word for it, though! Join us on our Bluffscape Amish Tours and be transported to another time as you watch the Amish farmers labor in their fields. See how the strong, beautiful horses pulling field equipment behind them are the ultimate Amish hybrid vehicle. Witness Amish women work tirelessly to produce and preserve food to feed their families, run a household, and craft beautiful quilts, baskets, and other goods for sale. The scene may spark a memory for many of the guests as they, too, worked in a similar fashion on the farm once, or recall parents and grandparents sharing stories of the days before tractors. So take a step back in time with me and book your ticket today! Whoa your horses! Stop in at Stone Mill Hotel & Suites in Lanesboro, MN to reserve your Bluffscape Amish Tour to learn about the Amish of SE Minnesota! It’s like stepping back in time when you see the silhouette of a horse and buggy in the distance while on our Amish tours. If Amish buggies are parked in the farm yard, you will have the chance to see the buggies up close. Many Amish farmers will have their horse-drawn field equipment set out to view as well. Guests on our tours have commented that it brings back many memories from their childhood or have heard stories from their parents or grandparents when they used to work with horses in the field while growing up on the farm. Work is more intensive on the Amish farm as it used to be in our family’s past, but it is very rewarding and humbling. Whoa!! Pull on in and ride along with Bluffscape Amish Tours in Lanesboro, MN! You will be glad you did.